We’d love your help. Let us know what’s wrong with this preview of Writer Get Noticed! by Colleen M. Story. Veteran writer and motivational coach Colleen M. Story helps you break the spell of invisibility to reveal the author Stop feeling invisible and start attracting the attention you deserve! Writer Get Noticed! takes a new approach, dispelling the notion that fixing your writing flaws and expanding your social media reach will get you the readers you deserve. Instead, discover a myriad of strengths you didn't know you had, then use them to find your author theme, power up your platform, and create a new author business blueprint, all while gaining insight into what sets you apart as a writer and creative artist. * Why improving your writing skills isn't enough. * Why it's critical you discover your strengths...and how to do so. * What's stopping you from finding the readers who love your work. * What you really want from writing and why that matters. * Easy methods to help you build a more successful author platform. * What truly motivates you and how to use that to succeed. * The author theme that unites your creative work and fits your style. * How imposter syndrome can stall your progress, and how to overcome it. * How to make better decisions about your writing career as a whole. To ask other readers questions about Writer Get Noticed!, please sign up. Be the first to ask a question about Writer Get Noticed! Grab a fresh journal and your favorite pen. Then kick off your shoes, and jump into the pages of WRITER GET NOTICED with both feet! The user-friendly exercises alone are with the price of admission. They revealed and explained things about myself I didn't know before. My favorite was discovering my strengths. But the author, Colleen Story, doesn’t stop there. She goes on to show you how to leverage them. I highly recommend this book! As a fan of Colleen M. Story, I decided to read a complimentary copy of her newest book for some help. Who knew that I could use my strengt I am a writer, yet I’ve lost my passion for it. I started my blog to review books. Okay, it was mostly for the free books. In writing reviews, I found that I enjoyed writing. Now, that I am writing more than reviews, I feel like I’m shouting my story to a blank wall. My readership is small and social media plays favorites in regards to reaching your audience. Every writer despite his or her expectations of the future, or accomplishments in the past knows the invisible feeling. Like any artist or creator, we write both for ourselves, to serve the muse, but for others as well. A beautiful dress unworn is not serving it's purpose; so too, a beautiful essay or novel. Colleen M. Story has written a book that every writer should read. WRITER GET NOTICED! is the type of book one must read with a pen and paper in hand. There are exercises and thought experim Every writer despite his or her expectations of the future, or accomplishments in the past knows the invisible feeling. Like any artist or creator, we write both for ourselves, to serve the muse, but for others as well. A beautiful dress unworn is not serving it's purpose; so too, a beautiful essay or novel. Colleen M. Story has written a book that every writer should read. WRITER GET NOTICED! is the type of book one must read with a pen and paper in hand. There are exercises and thought experiments meant to help build not just an in-the-moment snapshot of where a writer might be today, but also as archival footage. You will be able to return to the insights--your insights--again and again if you take her advice and engage with the activities. Throughout the book, Colleen uses astute references from science and academia, as well as stories and ideas from other other writers. Her style is approachable--a coach not a dictator. I follow her Writing and Wellness blog and recognized several of the voices she quotes in the book. For me, this amplified the feeling that Colleen and the writing community at large was behind her words. Writing is, I believe, a team sport. In Writer Get Noticed! the author states that “it’s time to create an author platform uniquely right for you” as your “platform is the key not only to the success of your books, but to your personal and professional fulfillment as a creative entrepreneur.” To that end, she provides a number of exercises for you to do as you read the book. “Though you could simply read the book and learn some important lessons, I guarantee you’ll gain a lot more if you work with me as we go.” She’s right. Don’t s In Writer Get Noticed! the author states that “it’s time to create an author platform uniquely right for you” as your “platform is the key not only to the success of your books, but to your personal and professional fulfillment as a creative entrepreneur.” To that end, she provides a number of exercises for you to do as you read the book. “Though you could simply read the book and learn some important lessons, I guarantee you’ll gain a lot more if you work with me as we go.” She’s right. Don’t skip these! I had the privilege of reading author Colleen M. Story's previous book, Overwhelmed Writer Rescue and was impressed. So I couldn't wait to get my hand on her latest title - Writer Get Noticed! - offering guidance for writers/authors trying to navigate the ever shifting sands of the current publishing landscape and dealing with the frustration of achieving what they envisioned. Both books offer exercises throughout to help you work through the ideas presented in each chapter. But in Writer Get No I had the privilege of reading author Colleen M. Story's previous book, Overwhelmed Writer Rescue and was impressed. So I couldn't wait to get my hand on her latest title - Writer Get Noticed! - offering guidance for writers/authors trying to navigate the ever shifting sands of the current publishing landscape and dealing with the frustration of achieving what they envisioned. Both books offer exercises throughout to help you work through the ideas presented in each chapter. But in Writer Get Noticed! the author takes you on a much deeper inward journey to discover your strengths, understand your decision making process, set goals, learn how to evaluate risk and more. I've been writing for over 12 years now - first magazine articles and then two published non-fiction books, with more in the planning stages. Regularly I have found myself at a loss at times to understand what direction to take in marketing and how to most effectively use my time. And I've found anytime I feel adrift, the writing process slows way down. This year I promised to change it up and try some more creative approaches to building my readership. I had already begun to make changes when Writer Get Noticed! landed in my hands. Perfect timing! My biggest take away right from the start was the idea of building a strong author platform around my brand, one I feel truly represents who I am as an author and what I am trying to do. I like that each chapter ended with exercises - important steps to help bring your personal voice to the surface so you can truly begin to understand your motivation and your strengths. Writer Get Noticed! is a superb resource for anyone struggling to establish their own author theme and platform in an increasingly crowded marketplace. I was very impressed with this book and found lots of the exercises and ideas were as helpful to me as a blogger because Story focuses on our motivations to write and how we can better develop our author platforms through a greater understanding of our individual motivations. The book doesn't attempt to shoehorn every author into a single line of actions, but instead asks us to think deeply about our own particular interests and goals. I had previously read and appreciated Overwhelmed Writer Rescue bu the same author. I strongly recommend you get your own copy of that book. So when I saw this new book, Writer Get Noticed!, I could not resist. I love it equally as much and strongly suggest you buy your own copy of this as well as others to give as gifts. Not only is Colleen M. Story well versed in her topic, she has such an engaging way to share her well research findings, that you are motivated and encouraged to work harder at I had previously read and appreciated Overwhelmed Writer Rescue bu the same author. I strongly recommend you get your own copy of that book. So when I saw this new book, Writer Get Noticed!, I could not resist. I love it equally as much and strongly suggest you buy your own copy of this as well as others to give as gifts. Not only is Colleen M. Story well versed in her topic, she has such an engaging way to share her well research findings, that you are motivated and encouraged to work harder at achieving your dreams. She writes about recognizing our strength and putting them to best use, working at strengthening what you already enjoy and do well, along with doing better at your less well honed talents. Once again there are plenty of real life examples offered to help you understand how you can put these steps into play. You can even learn to enjoy the journey and appreciate the time involved as your work improves and you find your proper audience. 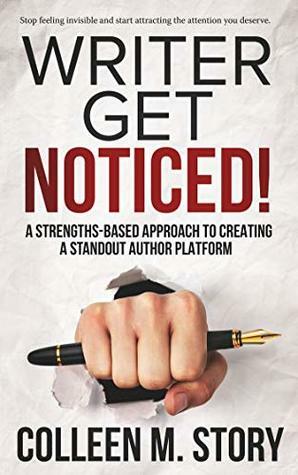 I thoroughly recommend the latest offering from Colleen M. Story, “Writer Get Noticed!” It’s everything a writer needs to uncover their strengths and use that knowledge to take on all the challenges that lay ahead. When I started reading this book I found it to be an engrossing read. Intrigued by the premise of using your strengths and skills to expand your writer platform, I read the book before tackling the exercises. I then read it again, notebook in hand and the results gave me a strong dire I thoroughly recommend the latest offering from Colleen M. Story, “Writer Get Noticed!” It’s everything a writer needs to uncover their strengths and use that knowledge to take on all the challenges that lay ahead. When I started reading this book I found it to be an engrossing read. Intrigued by the premise of using your strengths and skills to expand your writer platform, I read the book before tackling the exercises. I then read it again, notebook in hand and the results gave me a strong direction forward. I learned a lot and enjoyed it. The author focuses in on an individual’s strengths as a writer, shattering the traditional belief we should be working on our weaknesses. Once we discover where those strengths lie, we can go begin to utilize those strengths and talents to fit our individual style to our best advantage. This high quality book helped me focus on what is important to me as a writer. It’s all you need to achieve a great author platform whether you are a beginner or seasoned author - great work! If the words “author platform” make your eyes glaze over...it's because you haven’t read this book! Colleen takes her considerable expertise as a health and wellness writer and manages to make this topic captivating by focusing on the “why” as much as the “how.” Why are you really writing? Is it to get rich and win awards, teach and influence others, avenge an unhappy childhood, fulfill your creative potential, honor the transcendent? Whatever your motivation, your author platform is your abilit If the words “author platform” make your eyes glaze over...it's because you haven’t read this book! Colleen takes her considerable expertise as a health and wellness writer and manages to make this topic captivating by focusing on the “why” as much as the “how.” Why are you really writing? Is it to get rich and win awards, teach and influence others, avenge an unhappy childhood, fulfill your creative potential, honor the transcendent? Whatever your motivation, your author platform is your ability to attract readers and sell books. Not knowing why you write in the first place can lead to years of frustration if you confuse what you think you *should* want with what it is you truly want. Writer Get Noticed is the perfect companion to Story's Overwhelmed Writer Rescue, published in 2017. Having learned how to find more time to write regularly in 2017, I found myself with a growing body of work.i knew it was time to to find readers, but I couldn't find a clear pathway into that broad business. Writer Get Noticed answered my questions and gave me a solid path forward. I did read the entire book before doing the exercises, and felt I'd gotten a lot of insight from reading alone. How Writer Get Noticed is the perfect companion to Story's Overwhelmed Writer Rescue, published in 2017. Having learned how to find more time to write regularly in 2017, I found myself with a growing body of work.i knew it was time to to find readers, but I couldn't find a clear pathway into that broad business. Writer Get Noticed answered my questions and gave me a solid path forward. I have been coaching authors on their online platform for years. Colleen Story takes this much further and helps you take a deep dive into your entire author platform. She takes you by the hand and leads you on a journey to discover yourself, as an author. She shows you how to discover your strengths and how to harness them. There is homework and you must do all of it to really benefit from this book! I am still a believer in have a strong online author platform with a website and social media bu I have been coaching authors on their online platform for years. Colleen Story takes this much further and helps you take a deep dive into your entire author platform. She takes you by the hand and leads you on a journey to discover yourself, as an author. She shows you how to discover your strengths and how to harness them. There is homework and you must do all of it to really benefit from this book! Books and articles I’ve read in the past on author branding and platform tend to explain first why these tools are basic to the author’s success and then offer up a list of things we should do to establish a brand and create a platform. I’ve wandered through these manuals in a daze, wondering how on earth I can establish a platform based on four books in three genres, written over a period of ten years. I’m not prolific, I can’t seem to settle on a genre, and I love to experiment with style and Books and articles I’ve read in the past on author branding and platform tend to explain first why these tools are basic to the author’s success and then offer up a list of things we should do to establish a brand and create a platform. I’ve wandered through these manuals in a daze, wondering how on earth I can establish a platform based on four books in three genres, written over a period of ten years. I’m not prolific, I can’t seem to settle on a genre, and I love to experiment with style and voice. Colleen M. Story has taken a different approach to guide authors toward that platform that will attract an audience to our books. Whether a beginning writer or one with several books published, any writer will benefit from reading Story’s suggestions, doing the exercises, and making a plan. The most important part of that previous sentence is this: Do the exercises. Most of us think we know who we are, have a good grasp of our strengths and talents, and understand where we’re going with this writing adventure. I thought I did too. Sort of. By diligently reading Writer Get Noticed! and using my journal to write out the answers to questions in each section, I found that I have strengths I didn’t take into account and that all the books I’ve written, both published and unpublished, and multiple genres, do indeed have a common theme. That’s a pretty big discovery for someone who’s old enough to have figured life and writing out by now. I highly recommend Writer Get Noticed! by Colleen M. Story, especially if you’re willing to read and think about every page and do all the exercises. I’m glad I did. Gets to the heart of why you write, and what you should be writing to best use your creativity and feel fulfilled. I liked the quizzes and "assignments" although I'm using a big white board instead of journaling. This book has really helped me focus on what is important to me as a writer. High quality, professionally written. I got a free advance review copy of this book from the author under no obligation to leave a review. Writer Get Noticed! Offers Readers a Useful, Easy to Read Format. Story creates a handy self-help book for writers in Writer Get Noticed! Her writing style is very organized and arranged in a very easy to use, easy to read manner. She touches on virtually every area of the author as she guides readers to find, develop and grow their personal author platform. With conversational chapters, she leads readers to workbook-style exercises allowing them to really tailor each chapter to discovering and Writer Get Noticed! Offers Readers a Useful, Easy to Read Format. Story creates a handy self-help book for writers in Writer Get Noticed! Her writing style is very organized and arranged in a very easy to use, easy to read manner. She touches on virtually every area of the author as she guides readers to find, develop and grow their personal author platform. With conversational chapters, she leads readers to workbook-style exercises allowing them to really tailor each chapter to discovering and developing his or her individual strengths and goals toward a successful career in writing. A few years back, I read Colleen M. Story's fiction novel Loreena's Gift, which I loved and then her first non-fiction book Overwhelmed Writer Rescue, a resource book for writers and creative artists. Colleen is the kind of author who knows how to take all of her life experience in the writer and health field and combine it to produce books that are honest and make you see things from a realistic, and very unique way. In Writer Get Noticed! Colleen helps you to be the best writer according to the A few years back, I read Colleen M. Story's fiction novel Loreena's Gift, which I loved and then her first non-fiction book Overwhelmed Writer Rescue, a resource book for writers and creative artists. Colleen is the kind of author who knows how to take all of her life experience in the writer and health field and combine it to produce books that are honest and make you see things from a realistic, and very unique way. In Writer Get Noticed! Colleen helps you to be the best writer according to the strengths you have, and the best part is that she helps you to discover those strengths. No two writers are alike, so it makes perfect sense that creating the author platform customized to your strengths is the way to go. So how does she do this? Through exercises of self-reflection. Some of these exercises are easy, but many of them are hard because they really make you dig deep down, opening up your eyes to the hard, but not impossible, dream of getting noticed as a writer. Essentially, a writer needs to be a business person whether they like it or not and Colleen talks about this aspect. I loved the anecdotes and experiences from other writers that Colleen included in the book, making this also an inspiring read. It's clear that Colleen is a motivational speaker because this book is actually a workbook too, and she guides you step-by-step with an easy to read, motivating writing style that feels like she's right there with you. I suggest getting the paperback copy so that you can write your thoughts right in the book because that's how it's designed. No matter what kind of writer you are, whether an author, journalist, or blogger you can definitely benefit from the advice that Colleen dispenses in this down-to-earth but motivational resource book. Highly recommended for all writers who want to demystify the "author platform" concept and get to work creating one that rocks for them. This very readable book is like having a conversation with Colleen as she guides the reader through various effective journaling exercises to help writers understand their motivations, identify and Author Colleen Story knows the frustrations of being a struggling writer because she once was one. She found her niche by focusing on writing and wellness, and now she's sharing how she did it in her latest book, "Writer Get Noticed! A Strengths-Based Approach to Creating a Standout Author Platform." I’ve read Colleen’s Overwhelmed Writer and reviewed it. So I was eager to read Writer Get Noticed! and I was glad that I did. This book requires you to work through it. The author shares from her own journey and that of other authors and also looks at relevant psychological studies that come through in the exercises. To make it meaningful, you must do the exercises. Do them with paper and pencil in hand and watch your confidence and self-belief growing. Colleen’s style is easy and personal and yo I’ve read Colleen’s Overwhelmed Writer and reviewed it. So I was eager to read Writer Get Noticed! and I was glad that I did. This book requires you to work through it. Colleen’s style is easy and personal and you are drawn to look within yourself and acknowledge not your weakness, but claim your strengths and work on them. I recently completed reading and reviewing Craved about building your brand, and once again I come across this book encouraging me to build a platform. I think the Universe is sending me a loud message! Colleen M. Story is on a mission to inspire people from all walks of life to overcome modern-day challenges and find creative fulfillment. Her latest release, "Overwhelmed Writer Rescue," is full of practical, personalized solutions to help writers and other creative artists escape the tyranny of the to-do list and nurture the genius within. It was named Solo Medalist in the New Apple Book Awards Colleen M. Story is on a mission to inspire people from all walks of life to overcome modern-day challenges and find creative fulfillment. Her latest release, "Overwhelmed Writer Rescue," is full of practical, personalized solutions to help writers and other creative artists escape the tyranny of the to-do list and nurture the genius within. It was named Solo Medalist in the New Apple Book Awards (2018), and earned the Book by Book Pub Award for the best writing and publishing book in 2018.